Thumbing through the New York Times Style Magazine yesterday, two features caught my eye: one on the beautiful botanical compositions of the French artist Carmen Almon, and another on eye motifs in current clothing and accessories collections. 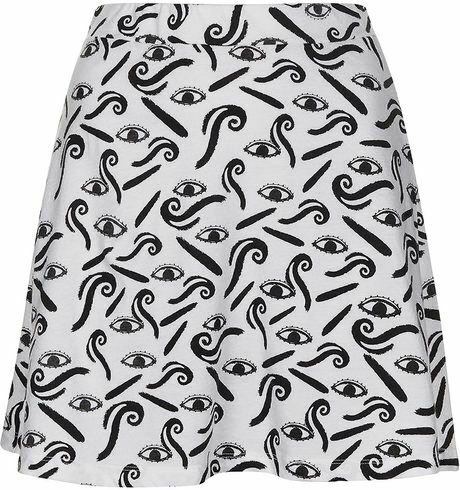 Everything comes around again in fashion, and there is certainly nothing new about the decorative use of the anatomical eye. 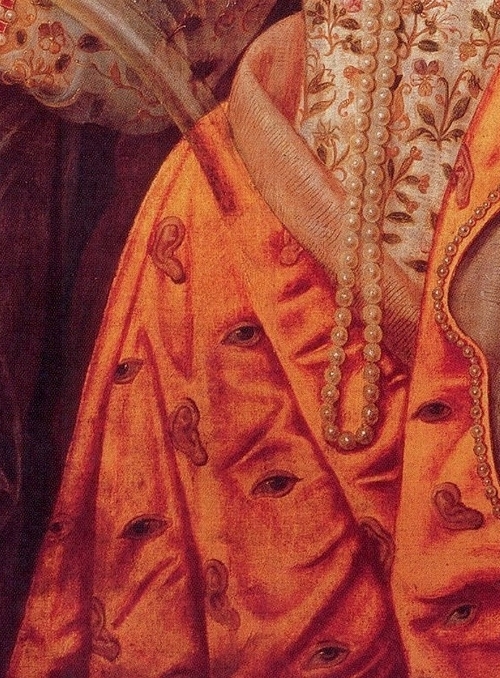 I was immediately reminded of one of the most spectacular portraits of Elizabeth I, the “rainbow” portrait by Isaac Oliver, in which all-seeing and all-hearing eyes and ears adorn the seemingly-eternal Queen’s gilded gown. 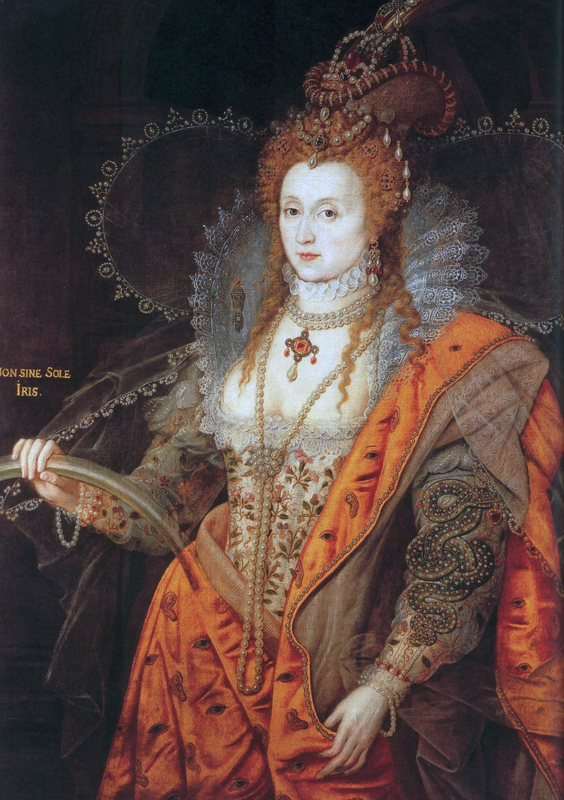 Isaac Oliver, The “Rainbow Portrait” of Queen Elizabeth I, c. 1600, Hatfield House. 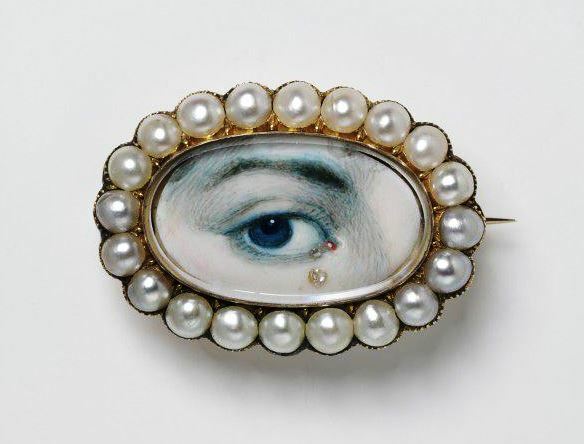 I was also reminded of the Georgian and Regency custom of wearing somewhat secretive “lover’s eyes”, miniature paintings of one of your beloved’s eyes, on a chain or as a brooch or ring, supposedly initiated in England by the Prince of Wales (later King George IV) as an expression of his devotion to his unmarriageable mistress, Maria Fitzherbert. 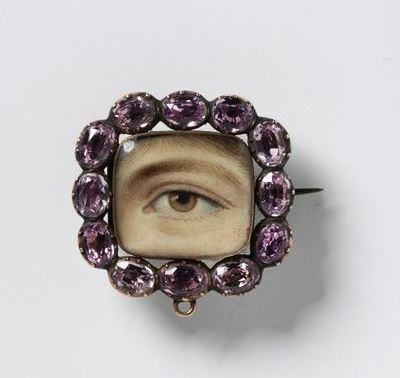 Eye miniatures seem to have had an earlier, French, political purpose, and then of course the “all-seeing” eye of providence became an important Masonic symbol that somehow found its way onto our own dollar bill, but the hundreds of decorative objects that have survived seem to be predominately love tokens. Two early nineteenth-century brooches from the Victoria & Albert museum are below, and you can see many more examples here and here. The Times “This and That” item, Eyes Everywhere, features eye-embellished flats and a gorgeous organza dress from Christian Dior, as well as the amazing “blue-eyed” ring by Colette and a Kenzo sweatshirt, both below. 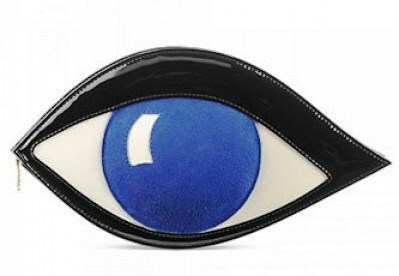 To complete the ensemble, I scouted out an optical skirt and another blue-eyed accessory–this time a clutch. It would take a daring woman indeed to wear all these items together, transforming herself into a veritable eyeful. Skirt by Illustrated People; Lulu Guiness clutch. This entry was posted on Monday, August 26th, 2013 at 6:55 am	and tagged with Art, Decorative Arts, Elizabeth I, Fashion, Shopping and posted in Culture, Design, History. You can follow any responses to this entry through the RSS 2.0 feed. Somehow it seems that humans have become accustomed to the magic– illusion, sleight of hand, trick, alchemy, and charm–of recognizing the world in a painting (the most unfathomable skill to me), but there’s such a shock and thrill in being presented with a god-like recreation of the natural world, in the varying unnatural forms used by the Blaschkas, Mary Delany, and C.A., and it’s surprisingly rare. Although, come to think of it, I guess there are all too many badly-done versions. But somehow I entirely missed the phenomenon of the eyes. I was obsessed with eyes, trying to draw eyes, and the fact that I did not have acceptably beautiful eyes, when I was a school-kid; I’ve also always wondered why there wasn’t more appreciation of detail, and the setting detail apart–framing it. But I don’t think it ever occurred to me to present an eye without it’s mate. This seems more charged than a lock of hair, doesn’t it? It certainly does: charged is a good word! Just how good can you be? Not o only you work on your material but you are good taste! Reblogged this on UPTOWN DALLAS ART COLLECTIVE.